We were a party of 11 IOW members and 3 from Derbyshire FF. Our pre-journey meeting with Eric and Shirley gave us a taste of delicious Indonesian food and the etiquette dos and don'ts. On arrival were given such wonderful treatment, showered with gifts and introduced to a totally different culture. Staying with Muslims, there was no alcohol (some of us lost weight). We met the British ambassador to Indonesia who was a most charming man. 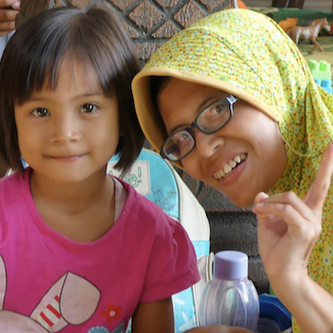 Kindergartens, universities and an International Conference on batik were all highlights. We saw amazing varieties of Indonesian art forms. Batik printing, silverware, shadow puppets, kite museum and fine arts to name just a few. The traffic in Jakarta was unbelievable; scooters everywhere. The city is vast with a population three times bigger than London. Yogyakarta is smaller with 2 million people. This destination is the arts centre for Java. The FF club members were much younger with many working families. The students were tasked as our guides. We visited several temples including the famous Hindu temple of Borobudier. We had many parties with very exotic food. A tsunami occurred in Sulawesi during our stay and some hosts who were medics packed their bags and left to help. We donated a sum from club funds on your behalf. The money was passed to the Major of Malu, the worst hit town. We hope you approve.